I should not be allowed to watch sports anymore; it’s just too hard on my psyche. And my nerves. And my stomach. So, my health in general. Even though I didn’t have a dog in the race, per se, I got sick over the action (or non-action, in this case!,) in this year’s Superbowl. Right up front, I have to say that I still haven’t gotten over how screwed the Saints were to not make the Super Bowl over the Rams in the first place. The Saints coach said that the team will never get over that worst non-call I’ve ever seen, and I’m right there with them—I detest unfairness. So this whole terrible game was painful to watch, on every level. The features and interviews on the many-hours-long pre-game coverage were pretty interesting. But I could have done without seeing Orange Hitler on there. That brought me down quite a bit. The most interesting note of the whole day for me is that the Patriots’ coach’s age is double that of the Rams coach. It was for sure the most boring. When the highlight of it is the longest punt in Super Bowl history, (by Johnny Hekker of the Rams,) you know there hasn’t been much action all along. It was also the first Superbowl ever with no touchdowns through three quarters!!! Wow. My only solace in the Patriots winning once again is that, since I love twins, (and wish I had one myself, although I might be jealous of her,) I am happy for the McCourty twins, (the first twins in the Superbowl ever,) especially Jason, the one whose first year on the team this is. Gladys Knight, all in white. That was a strange choice to book an act that few people have heard of, Chloe and Halle, to sing America the Beautiful. They were okay, but far from special. Just when I was asking why they hadn’t just gotten Gladys Knight, (because they obviously wanted someone from Atlanta to fill these spots,) they did! She sang the much more prestigious National Anthem. Now, that was special! That’s sangin’!!! And she’s lost so much weight that she could wear white! So, you go, girl! OMG—was that a snoozefest! It was the worst halftime show I’ve ever seen! Mr. X said, “The only thing worse than the game was the halftime show.” But I think it was a tie. 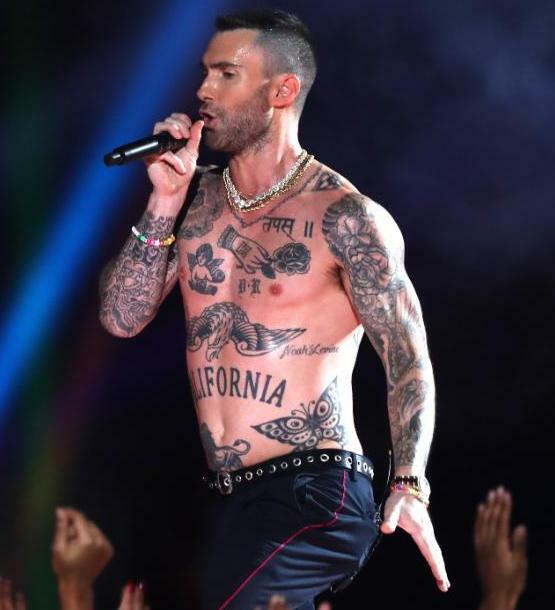 Adam Levine was trying to show that his body is not as skinny as his head. But that shirt, bracelets, necklace (or chains,) and moves were—how shall I put it?—so much less than masculine. Mr. X said the halftime show reflected the boring score—3-0. And where was Maroon 5’s supposed big “message” that they said was going to appease the people who wanted all big music acts to turn-down doing the show because of the Colin Kaepernick kerfuffle??? Surely “ONE LOVE” in lanterns, or some such objects, was not it. Or was it? For once, I didn’t really hate any of these super-expensive ads, but there were few I was really taken with, either. My favorite by far, and the only one I choked-up over, was the Microsoft Xbox Adaptive Controller. It’s not the presentation that got to me—it’s the actual product! It’s so long overdue. I so admired the Mercedes A-Class ad that I may actually get one now!!! I got a kick out of the Hyundai ad where Jason Bateman was the elevator operator. I know that humorless vegans are up in arms over it, but it’s a riot. Cumulatively, the T-Mobile “texting” ads were good, especially the final one, about the father thinking text and Google are the same thing! The first Bud Light ad, letting us know that it’s the only beer made without corn syrup, was really good. They definitely made their point. Conversely to my last thought, the Bud Light jousting ad totally sucked, because it turned-out to somehow be a promo for Game of Thrones, which made it uber-confusing. The one for Audi’s e-tron electric car was really stupid. While he’s choking, a guy sees his dead grandfather, which is just creepy. That one ad made me not want to get an Audi now, which I was really leaning towards! The one for avocados, with humans as dog show contestants, was just stupid. And creepy! The Kia Telluride ad was so depressing. It looked like a town full of suicidal drug addicts, which is never an upper. Finding Tracy Wolfson in this pic is like doing Where’s Waldo?! She’s the tiny woman being squished behind Tom Brady, who knew she was there, but did nothing to help her! Photo by Karen Salkin. 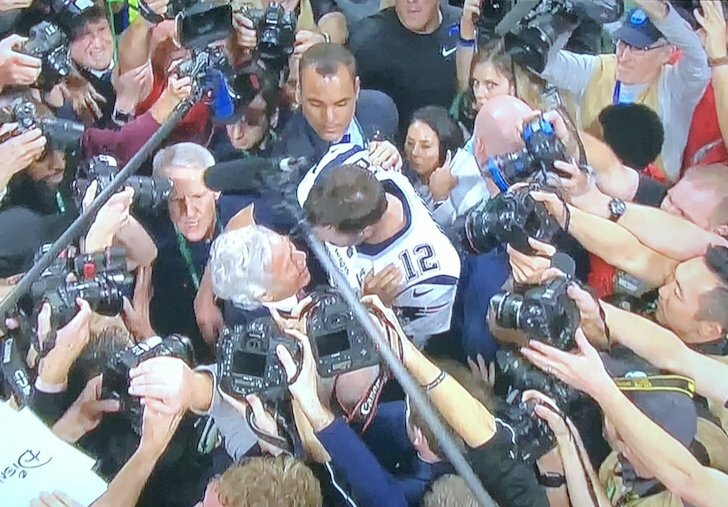 Poor tiny reporter Tracy Wolfson was trying desperately to interview Tom Brady, as is her job, but the madding crowd just swallowed her up! Frightening. Tom, the narcissist, knew she was there, and should have looked out for her. I didn’t think I could like him less than I already did, but now I do. As always, the network that broadcasts the Superbowl tries to take advantage of what they assume will be a gigantic viewing audience. But in this case, it was the lowest Superbowl ratings in a decade, which is good, because the shows that followed it were just as dreadful as the game itself. I’ve actually never watched Steven Colbert’s talk show on purpose, (I have nothing against him; there’s just not enough time in life,) but I do hear it occasionally when Mr. X has it on. And I can say that this was perhaps his worst outing ever. I heard the entire hour, and I didn’t even get one laugh out of the deal. Who thought that old man Patrick Stewart, a funny-looking hockey mascot, and Steve Carrell were attractive post-the-biggest-sporting-event-of-the-year guests??? Those bookings went along with the rest of the entire lackluster day and night on CBS. And that wraps it up for this year’s not-so-Super-Bowl. Let’s hope that the NFL makes a lot of changes to their officiating next year, and we get a better contest. I can only imagine how fun a Saints-Chiefs competition would have been!!! But then I would have been rooting for them both! 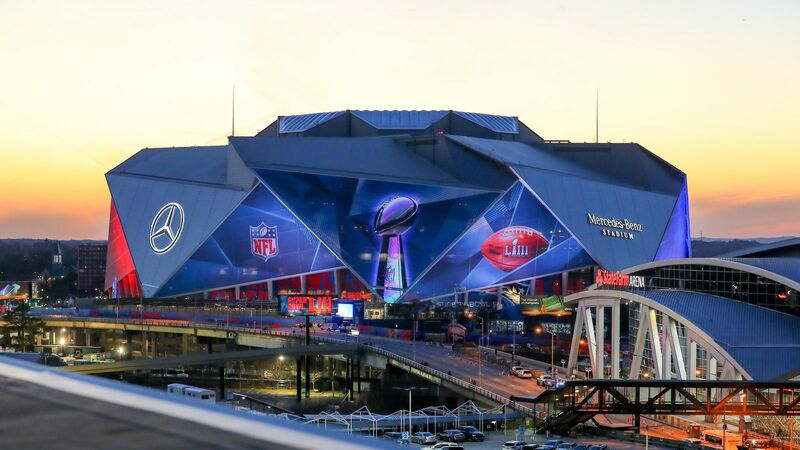 And I agree with it…………most BORING Super Bowl. Commercials? Meh. Half-time show? There was one? I had more fun schmoozing with my friends in the kitchen!